The pedestrian infrastructure however, is an utter failure. The walk lights don’t work, sidewalks on two of the four corners are dug up and not replaced (and have been that way for at least several weeks if not longer); generally, very little thought or care seems to have been given to pedestrians (or cyclists for that matter) at all. Below is the view from the center of the intersection, where there is a raised traffic island that has no place for pedestrians to stand, meaning it cannot be used as a pedestrian refuge; you can simply cling to the edge of it like a life raft and hope you don’t get sideswiped by an errant driver texting or applying makeup or eating a Boston Kreme or some such. The island on Point Street at the east side of the intersection has been removed to create a left turn lane. I’m a rather aggressive pedestrian, but I simply would not attempt to cross Point Street here, it is far safer to cross midway between here and the bridge, where there is a traffic island (yes, I am saying, it would be safer to jaywalk). This exact configuration is temporary (see final plan below) to accommodate traffic detoured by ramps that are closed and others that are not yet open, so this being not exactly the best environment for pedestrians I can understand to a point. It’s not really a very good excuse though. I lived in Boston when the Big Dig was ramping up, and though you would never be able to walk the same way twice as detours were constantly moved, MassHighway made sure to accommodate pedestrians, and as confusing as it was sometimes, you could navigate downtown on foot. The values in Boston would not allow for anything less, why should we accept less in Providence? And even as temporary as this configuration may be, how hard is it at the absolute very least to turn on the walk signals? I mean, they are there, with countdown lights and everything. Just turn them on. The intersection would still be an utter nightmare for people on foot, but ever so slightly less nightmarish than it is now. The state of this intersection brings up two huge concerns. The rebuilding of the grid will be a nightmare for pedestrians and cyclists as RIDOT focuses on moving cars at the expense of feet and pedals. And, is this what Wickenden Street is going to look like? This is the second of a series of posts we will be doing about the 195 Street Grid. To view all the posts and more information, please visit our 195 Relocation Project page. Work in Davol Square, have tried in vain to get DOT to notice, and do something. Also a horror the way people right-on-red off Eddy onto Point – many don’t stop and look. They just roll along – and we’re in crosswalk. Amazing. Thanks for shedding light on a dangerous situation – maybe this will help the City and State to notice? If not, they might notice when someone gets mowed down in the not-too distant future. 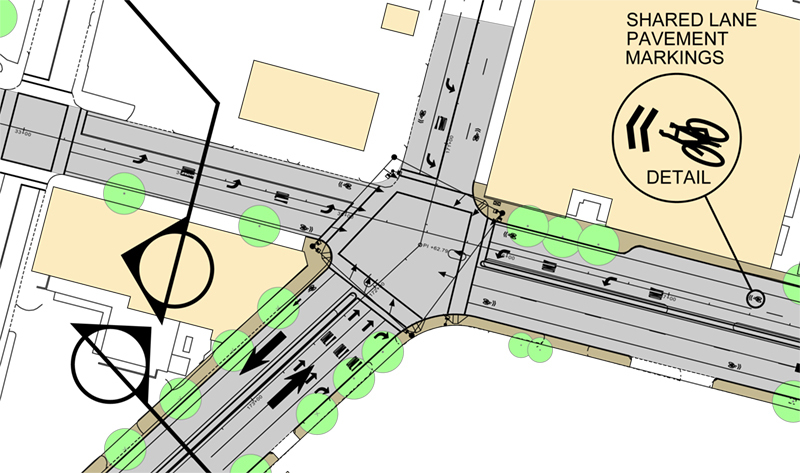 Oh, no, RIDOT wants to make the Wickenden intersection better by having pedestrians cross traffic three or four times to get all the way across and walk down that center island of green tranquility. Matt, that second lane is crucial if you’re one of the several hundred people who work at Davol who turn eastbound from the parking lot to leave the building. Without it, I’d have to wait for rush-hour traffic to clear on both sides before I could leave (which could take several minutes per-car), or I would have to go through downtown instead of just hopping over the bridge (which would add traffic to downtown’s rush-hour). Also, the bridge itself is two lanes eastbound so through-traffic bound for Wickenden doesn’t get crammed-in with people lining-up for the 195 onramp. I don’t have much -good- to say about the Point St./Wickenden stretch from Service Road 7 to Hope St., but those two things are ‘a good thing’, it’s a little late to cut a lane out of the already-built bridge (and to what end? there are safe walkways that accommodate bikes on each side, assuming they’re plowed). What really bothers me is the section of Point St. under the old 195 and the whole turnaround/offramp/onramp thing, I think it just takes up too much space, confuses drivers, and puts pedestrians in danger. I’ll be glad to see that mess go. Also, Eddy St. and Point St. is a disaster for pedestrians. There should be a law about finishing one project before starting another. I have a feeling I’ll be seeing snow fall on the unfinished sidewalks on the ‘Hess’ side of Davol this winter. Thanks for the clarification about that second lane and traffic entering from the parking lot, since I don’t drive a car through there, just bike through it at hours when people aren’t generally going in or out of the lots (7-7:30 AM, 4:30-5PM, weekends), I hadn’t seen that. I was in Davol Square on Thursday. No changes here, walk lights still not on, sidewalks still incomplete. This intersection would have been put to better use if we got rid of the traffic light all together. Instead, lets replace it with a landscaped roundabout, perhaps paying some homage for the public square it is named for. This option would reduce traffic speeds, increase safety, provide street-scape beautification, and eliminate the need to run power utilities for a signal.